Binaltech WildRider never materialized and I doubt it ever will. Maybe there's a Breakdown in the future. d00d! I know that bot!!! This page contains a single entry by Nala published on March 17, 2007 7:04 PM. That's right! Indestructible Wakandan vibranium! was the previous entry in this blog. 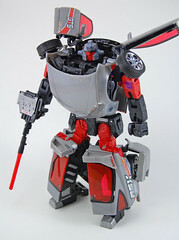 6" Titanium Starscream is the next entry in this blog.